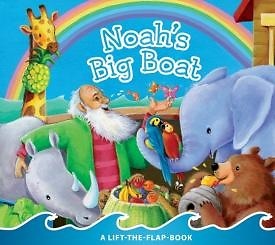 Part of a trio of interactive lift-the-flap books, Noah's Big Boat retells the favorite story of Noah and the animals on the ark. The jumbo size flaps on each page unfold to tell the story and show the hidden image, making it easier to remember the story. Kids will want to find the animals by unfolding the flaps while learning about God's word.